Part 1: Trochanteric Bursitis : Iliotibial Band (ITB) Syndrome. 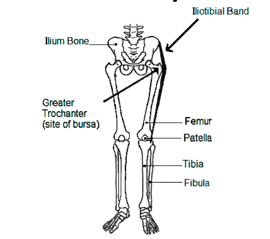 The Iliotibial band or ITB is a length of retinacular tissue that runs as shown in the diagram above. This tissue is very tough and is not able to be stretched as muscle, tendon or ligament may be. As you can see, the band changes direction around the greater femoral trochanter, a notch of bone in the lateral buttock area. Pain usually occurs at this point and can be located by palpation both at the dimple of the buttock and along its course in the lateral thigh. The insertion into the tibia (adjacent to the fibular head) may also become inflamed. ITB pain is frequently misidentified as sciatica or referred pain. Pain most commonly occurs while lying on the affected side in bed. It is usually also troublesome to lie on the contralateral side if the sore leg is allowed to slump medially, touching its knee to the bed. The patient will commonly report having some relief sleeping with a pillow between the knees. Pain does not always occur when walking but when it does, it is usually worst on a slippery surface as this allows more rapid limb rotation. In females, the greater trochanter is much more prominent than in males. (Men are far less likely to be afflicted by ITB syndrome but often have a severe case if they are). With excessive foot pronation, the whole lower limb will be internally rotated as the talus bone adducts. This increases the angle of the ITB at the trochanter and also increases the distance between the origin and insertion of the band by up to 6 mm. As the ITB cannot stretch, this presses the band against the bone. In this orientation, the band is “tight” – though not because it is shortened – rather that origin and insertion have move away from each other. Lying between the ITB and the bone is the trochaneric bursa, looking not unlike an oversized jelly-bean. Too much pressure will cause an inflamed and painful bursitis. As described earlier, the band does not respond well to stretching, indeed the added pressure often worsens the complaint. Massage too is painful and of no benefit. As the bursa has very poor blood supply, nearly all anti-inflammatory medications have little effect with the exception of centrally acting drugs such as codeine. Topical anti-inflammatory rubs cannot penetrate the thick gristle to reach the inflamed bursa below. Physical methods of reducing inflammation such as heat and ultrasound will generally help to a degree until the area is irritated again by walking. Happily, this condition responds very well to a simple treatment. The use of an in-shoe orthotic device can stop excessive pronation at the foot, reduce and slow internal rotation of the leg and thigh and limit the amount of force with which the ITB flicks over the greater trochanter during gait. This will return the band to the correct length thus eliminating the tightness. This rotation is quite difficult to control, needing tri-planar orthotics and for this reason one-size-fits-all insoles from sport shops or chemists are not suitable. If you would like to ask any questions or be provided with further reading on the topic, address your communication to Stephanie Cosgrove at info@walkwithoutpain.com.au or to our clinical locations in Hamilton, Indooroopilly, Toombul or Bribie Island by using this Contact Us link.